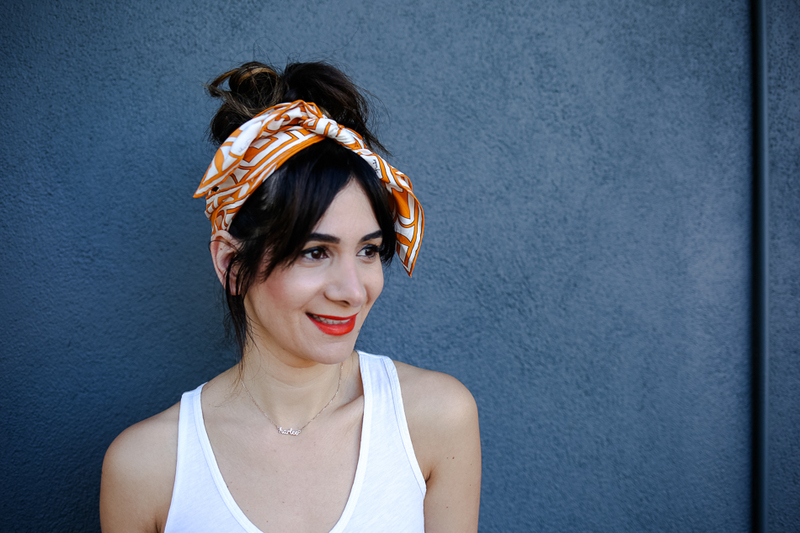 Start with a square scarf. Fold one corner to the other to form a triangle. Fold the corner down to about the middle, and then fold again until your scarf is about 2 inches wide. 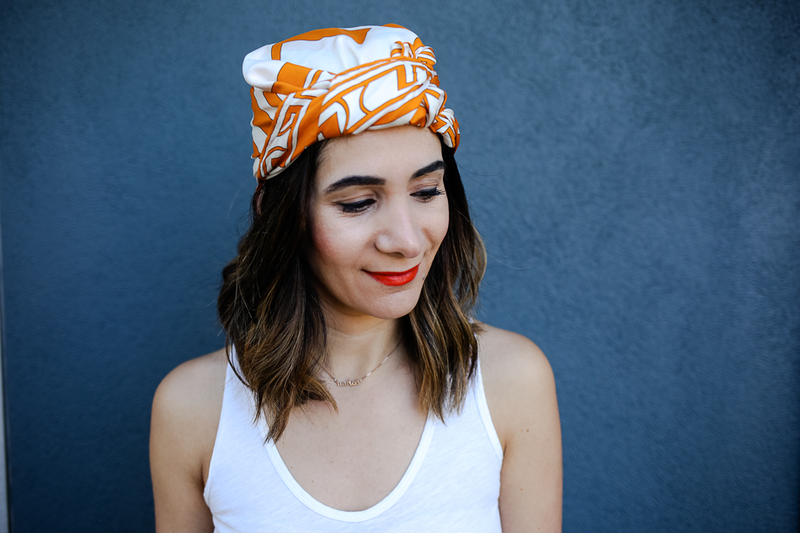 Put the scarf around your head with the ends in the front, making sure the folded side of the scarf is against your head (make sure any tags are hidden). Twist at the front tightly. 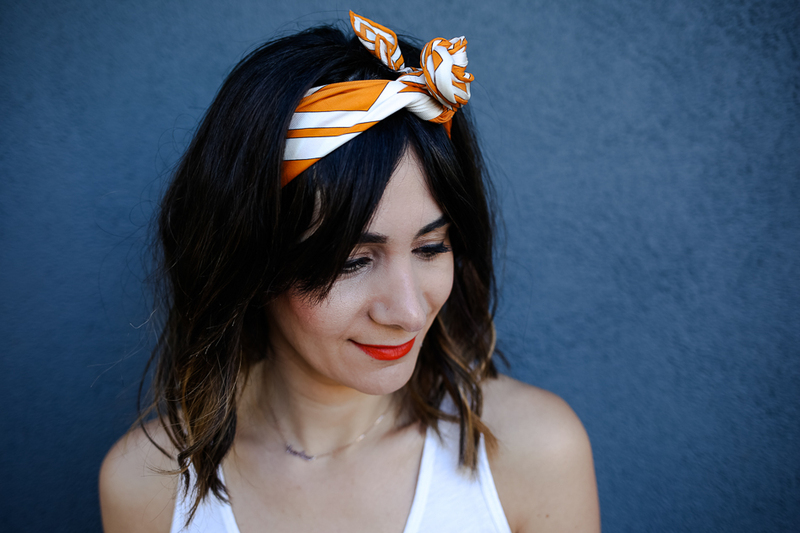 Tuck the ends behind/underneath the scarf and secure with bobby pins. 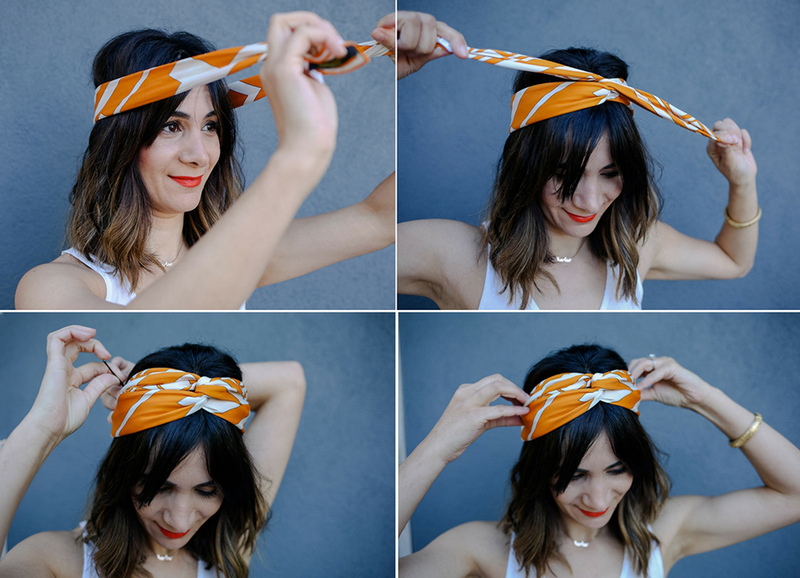 Start with a square scarf. Fold one corner to the other to form a triangle. Fold the corner down to about the middle, and then fold again but leave it thicker. I like to pull my hair into a messy topknot. If your topknot is sleek, mess it up a bit! Tie it in a loose knot at the front. I double knot it to secure the scarf. Start with a square scarf. Fold one corner to the other to form a triangle. Place the scarf with the pointed corner toward the front and bring the ends to the front. Tie it in a loose knot at the front. Tuck in the ends into the scarf. 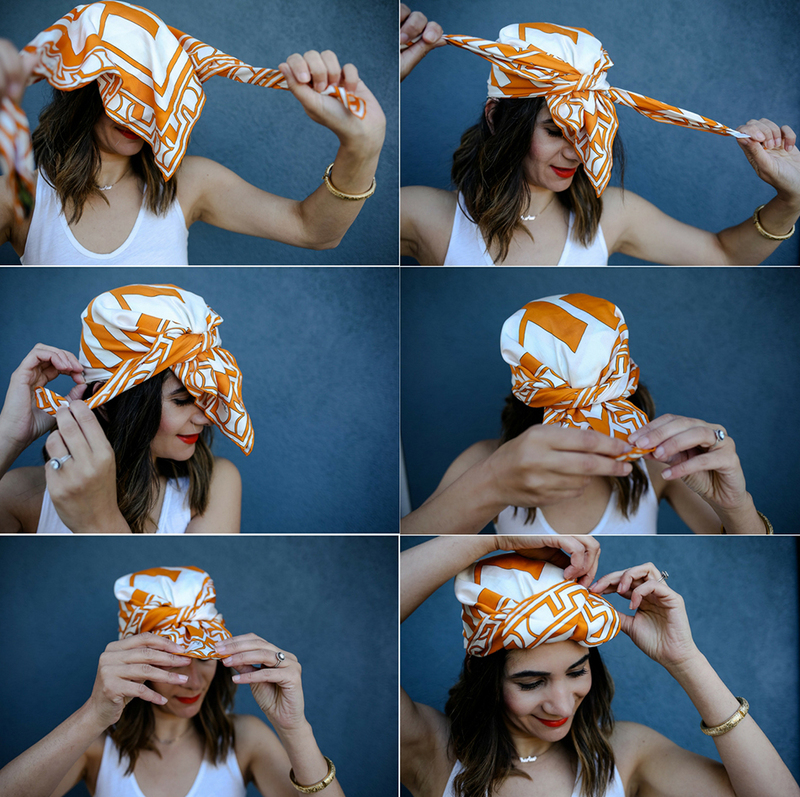 Pull the “v” flap up and tuck in behind the knot. Tie it in a loose knot at the front. 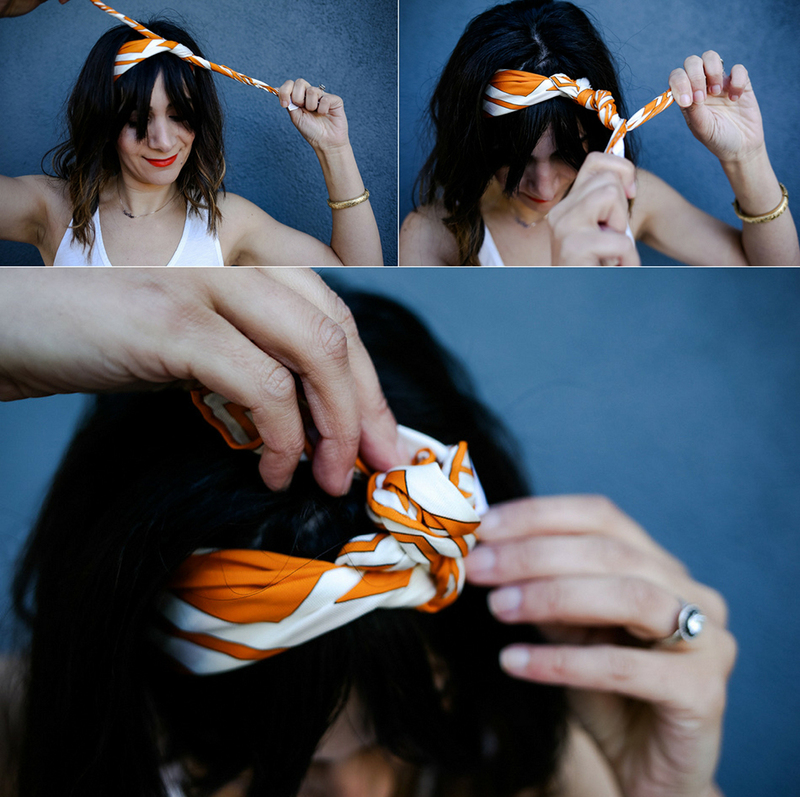 Twist both ends of the scarf in opposite directions and then twist them together. Loop the twist together and tuck in to create a rose. I have a few of these and need to start wearing them more! I so need to start wearing my scarves in my hair. I love all of these and your pics give me no excuse for not knowing how to do it. I think the twisted headband is my fav!! 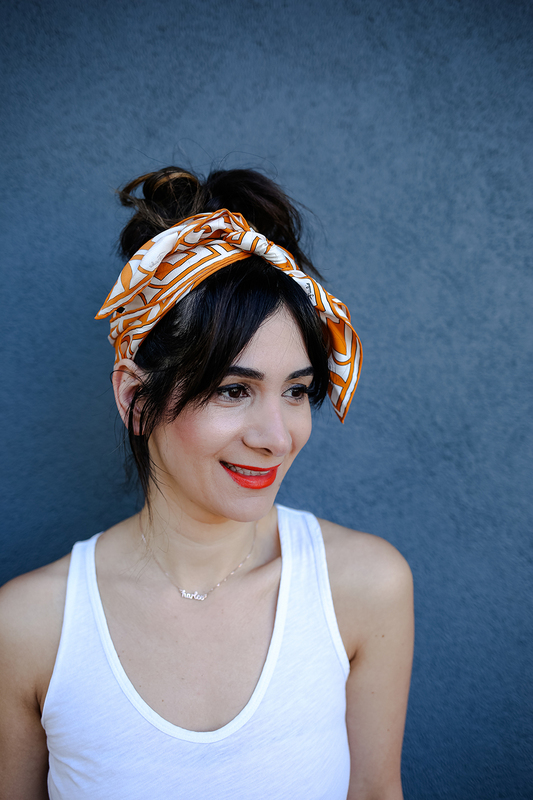 Love all the ways you’re rocking the scarves. The images are so helpful! All these versions are adorable! I used to wear “head wear” all the time but have kind of forgotten about it. Always a cute touch in the summer though! LOVe this as a hair accessory! I’ve been waring mine like this all the time lately. 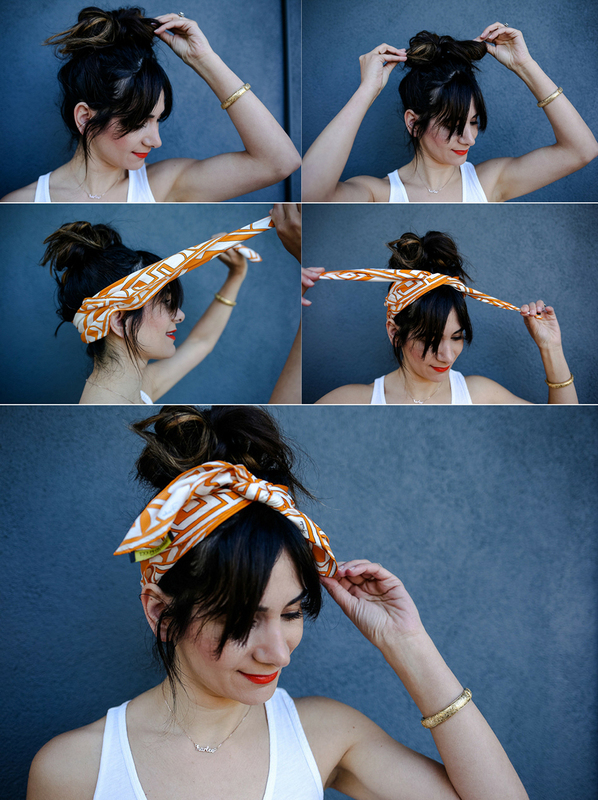 Ok I’m definitely going to have to try this when it gets super hot this summer — what an adorable look! OMG! These are so cute!!!! I need to try this. I’ve always wanted to try this trend but I never could pull it off, but now I am inspired by your awesome tutorials! Okay this is my new goal to try all of these! they look so great! I love this! 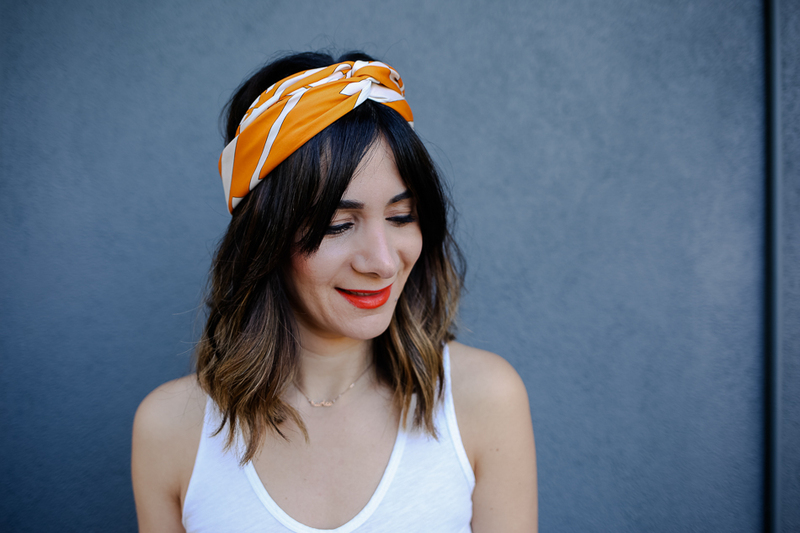 Hair scarves/headbands are becoming so popular again and I am so happy about it! what a great post. i need to bookmark this for sure. I always forget how to actually style it when it comes time to wear one!